I am overwhelmed by the positive response from my fellow food bloggers on the launch of my own food blogging challenge #ShopLocal. Thank you for a wonderful variety of recipes showcasing ingredients local to where you live, from as far away the #ShopLocal origins in Shetland, a remote island in the North Sea, throughout Scotland and England to the South of France and even Houston, Texas! October’s challenge linky can be found at the bottom of this post, so if you make and blog a recipe this month using a local ingredient, tell us all about it! Also, Dom over at Belleau Kitchen hosts Random Recipes and this month’s challenge is all about using local produce, so might like to link up with his challenge too! So, without further adieu, here’s September’s Shop Local round up. 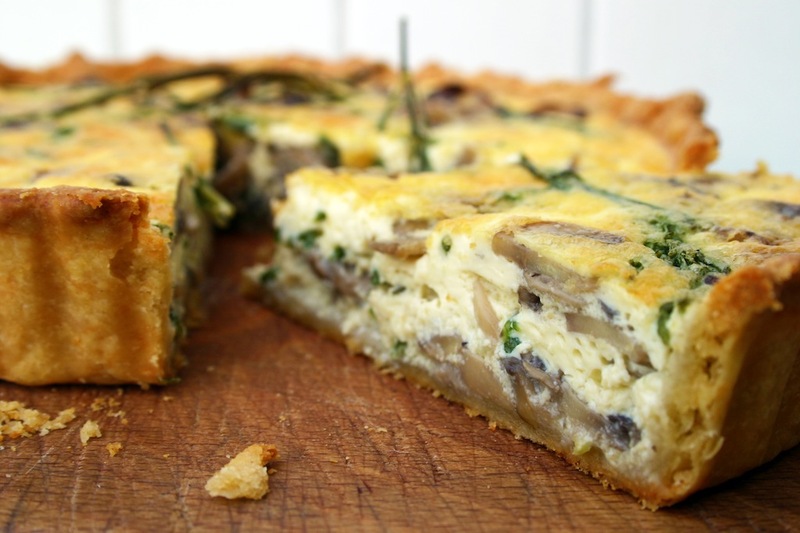 Dom from Belleau Kitchen was quick off the mark to share his mushroom, garlic and samphire quiche recipe. Samphire grows wild in the salt-marshes near his home in Lincolnshire, England, but he was given some home grown samphire by a very generous neighbour. He writes, “it works well as both a vegetable and serves wonderfully with fish and chicken but also as a herb used like I have here alongside mushrooms and garlic and a little rosemary… it has a beautifully salty taste that compliments parmesan too, so i’ve included some in the pastry.” Sounds delicious! 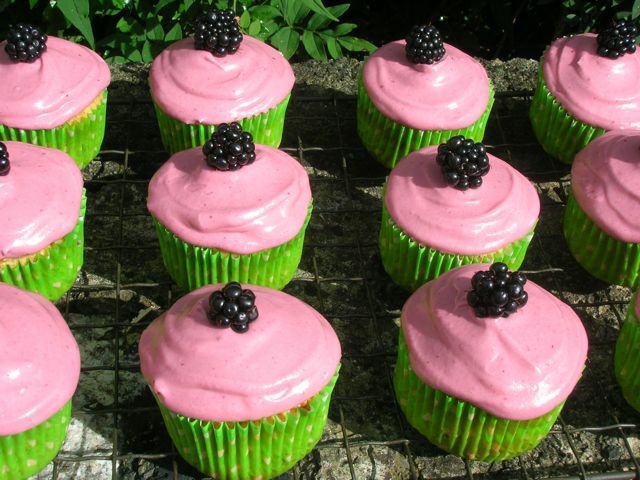 Choclette from Chocolate Log Blog uses local eggs, organic milk and wholemeal flour from near her home in Cornwall, UK to make these gorgeous blackberry and apple cupcakes. The blackberries themselves were windfalls from her own mother’s garden. Choclette always includes chocolate in her recipes, and although chocolate is not grown in Cornwall there are plenty of other ingredients from local producers that are. Look at the colour of that frosting! It looks so very tempting I just want to jump into the photograph and start eating! Karen over at Lavender and Lovage uses her own windfall organic apples from her garden in the Charente Maritime in south west France in this curried leek and apple soup. As each bowl contains a mere 100 calories it is suitable for those on a 5:2 diet and leftovers can be frozen into individual portions. 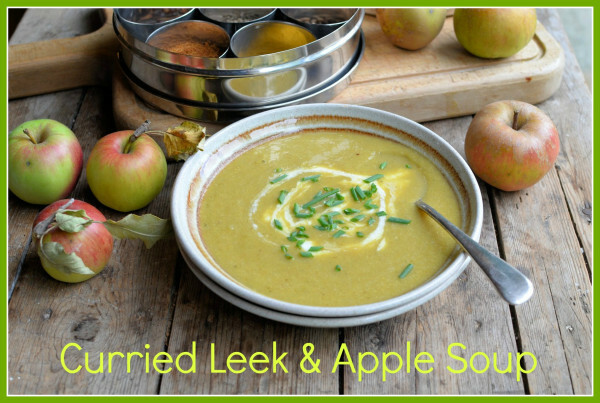 This comforting spicy and warming soup sounds like t perfect meal for these cold Autumnal evenings, and I bet the flavour of the home grown organic apples is out of this world! 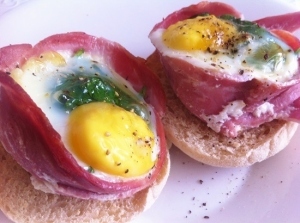 Emily from Emily’s Recipes and Reviews uses local to her Leicestershire, England eggs in this baked lazy eggs breakfast, perfect for a quiet Sunday morning, I think! Her little bacon wrapped baked egg parcels are served perched on a toasted English muffin. Mmm… I’m salivating! I love her photographs of the little wicker baskets she bought her eggs out of and the gorgeous colouring of the vibrant yolks can never be found in a caged supermarket hen’s egg. Janet from The Taste Space takes us on an enticing journey through The Last Organic Outpost urban farm in Houston, Texas in her Shop Local entry. 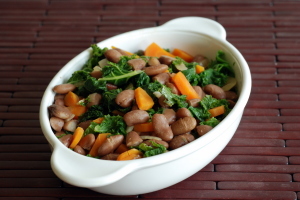 Janet used some of the kale she bought in a sampler bag at this farm to make this colourful and tasty southern beans and greens saute. She also uses an ingredient I’d never heard of before: liquid smoke! Sounds intriguing! I’ve also learned, from her post, that summer is between seasons for vegetable growing in Texas because it’s just too hot. Vegetables are harvested in the Spring and Autumn. 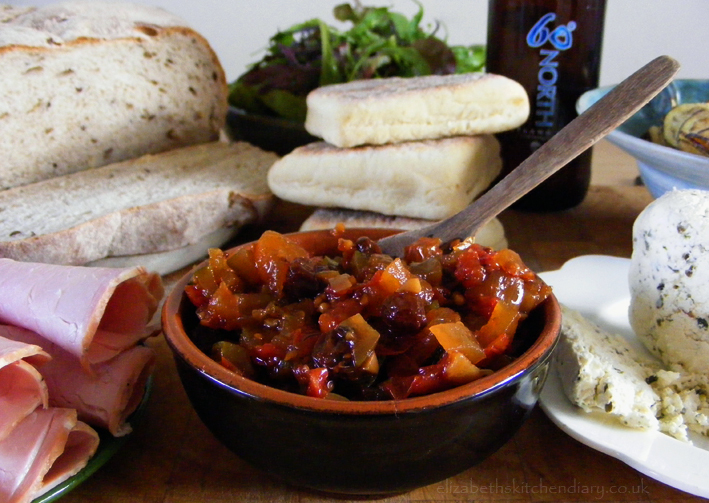 My own entry this month is a spiced tomato and courgette chutney made with some ingredients from my locally grown organic vegetable box. The chutney was served with a selection of local produce from around Shetland, my remote home in the North Sea. This produce included artisan cheese containing seaweed, local beer, bannocks and potato crisps made from the vintage Shetland black potato. 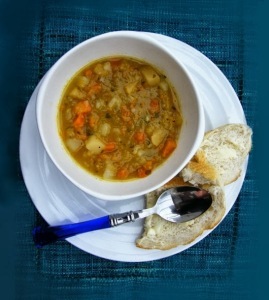 Jacqueline, the Scottish vegetarian at Tinned Tomatoes shares her Scottish tattie, neep and carrot soup, a thick wholesome soup perfect for these Autumnal evenings. Her post also takes us on a trip with her to Comrie and the West coast of Scotland, where she recently went on a family holiday. On the way home from this holiday she picked up some vegetables at a farm shop and made this filling soup with them. Neep, turnip, tumshie or swede? What do you call your rutabaga? Claire over at Foodie Quine gets most of her vegetables from Ferniflatt in Aberdeenshire, Scotland. First she stuffs courgette flowers with mascarpone cheese, crab, lemon zest and chilli before deep frying in a beer batter. She shares a recipe for a courgette, potato and onion bake which she tops with the remaining courgette flowers, photos of some Scandinavian style meatballs she made using beetroot, an interesting sounding purple cauliflower, potato and cheese soup and Nigel Slater’s courgette cake with apples and pecans. Claire certainly gets creative with her vegetable box! 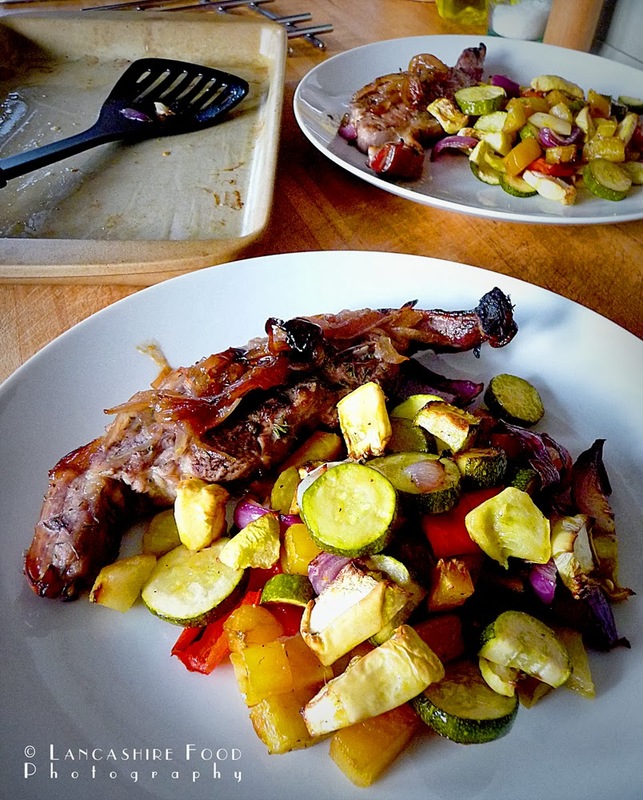 Over in Lancashire, England, Linzi from Lancashire Food uses lamb chops sourced from the farm just up the lane from where she lives marinated in a chutney from a great local producer and serves them with roasted vegetables all sourced from their very own garden. This lamb chop with roasted garden vegetables dish looks superb and bursting with vibrant colours and flavours. It’s a one pan dish meaning there’s very little cleaning up to do afterwards, and as it is quick and simple to make it’s an ideal midweek meal! Janice at Farmersgirl Kitchen loves British Pudding. 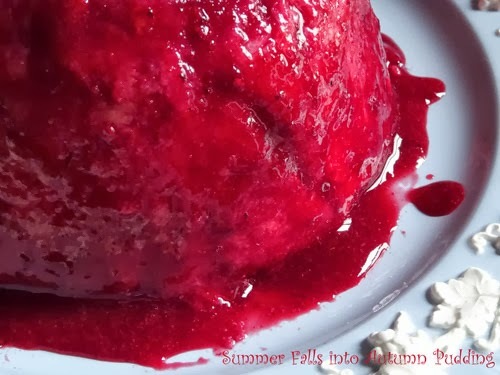 However, since she didn’t get the chance to make one this summer she thought she’d get creative with some fruits including blackberries from her hedgerow in Scotland and some local Galloway chilli raspberry jam to make this luscious looking Summer Falls into Autumn Pudding. I’ve never tried British Pudding myself, but I’m very much tempted to give this a go, especially as Janice provides very helpful step-by-step photographs of the technique. Just look at this dish! Beautiful! The world has certainly grown smaller over the last few decades. Our food, especially in the West, is shipped to us from all over the world. For example, a trip to my local supermarket in Shetland presents soft fruits from Spain, fresh herbs from Israel, lemons from Argentina and lamb from New Zealand! Lamb all the way from New Zealand?! A quick look outside my window shows me fields full of lambs, why are they sent from New Zealand? The effects of this mass transport of food has global implications. There is an unfair global distribution of food and the environmental damage caused by this transport is alarming. This is in addition to the loss in food quality that occurs during transport. Vegetables harvested thousands of miles away lose much of their vitality by the time they get to your plate, whereas a courgette from your local veg box, harvested and eaten on the same day, is bursting with nutrition. We don’t need to look thousands of miles away for produce as there is a wide array around us. Each of us have a favourite local producer, don’t we? Mrs. Smith and the home made marmalade she sells at the Farmer’s Markets, your local cheese maker at a pop-up stall in a shopping centre, your butcher down the road selling locally reared meats, your veg box provider, the crofter who sells her eggs at the end of her driveway, etc. 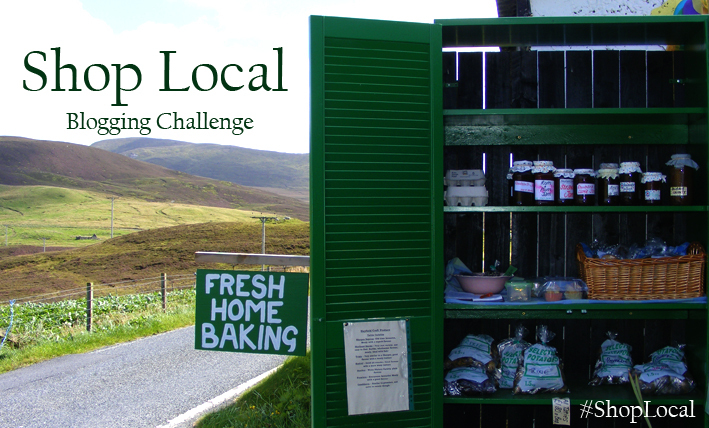 Here I present a food blogging challenge with aims to promote your local food producers and share your recipes using their produce. This is the place to showcase the wonderful foods available where you live, where ever you live, worldwide. 1. Write your blog post showcasing an ingredient sourced locally and post your recipe url to the Linky at the bottom of the appropriate month’s challenge, including your email and the title of your recipe or post. Tell us a bit about where the ingredient came from, with a link to the producer too, if available. 2. Display the Shop Local badge (as shown above) to the relevant recipe post, with a link back to the monthly challenge post. 3. Add as many recipe links as you like, there’s no limit! Share the local producer love! 4. If you tweet your post, please mention #ShopLocal and @TangoRaindrop in your tweet – I will retweet all that I see. 5. The recipe can be one of your own or one you’ve seen elsewhere, but make sure to credit the source. You are very welcome to republish old recipes/posts but please add the information about this challenge as listed above with the Shop Local badge. 7. The challenge runs from the first day of the month to the last. A new challenge Linky will be added to the end of the round-up blog posts on the first day of the month. I love seeing all the different things people make. Thanks for a great selection. Wonderful idea! Off to decide what to post for it. Love the sound of this challenge. I do try and shop locally if possible so will join in when I can. 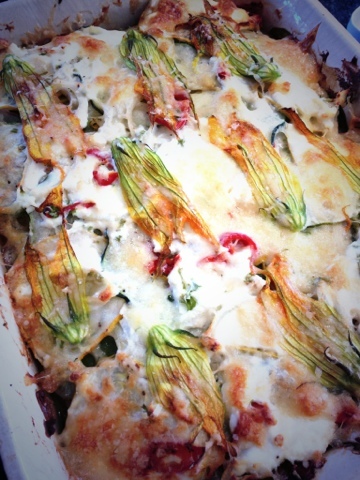 Lovely round up of recipes from last month, can’t wait to see the round up this month. Thanks 🙂 I do hope you get the chance to join in sometime! Hello! I have entered my recipe too. This is a great challenge, thanks for hosting! A great roundup. Thanks for including me. I’ve added the new challenge to The Food Blog Diary for you. That’s a fine set of recipes for a very fine challenge. I’m kicking myself that I couldn’t find time to enter. I must try again. Lovely challenge! Super round up! Thank you! I’m so pleased at how lovely all the entries are for the very first round up. Everyone is just so talented! Thank you Karen! I’m so delighted to have you on board with my new challenge, thank you thank you! Can’t wait to see what you make this month! it’s a brilliant challenge and I have reflect this and championed you this month in my random recipes challenge theme (hope you don’t mind…) Loved taking part and look forward to it again this month! Well done for the excellent round-up!